Eastbourne once again turned it on for the windsurfers, with winds from 25 to 30 knots for most of the day allowing 13 races to be completed. Conditions were fast and demanding with plenty of spills and some close finishes for the 22 sailors who turned up to sample the windiest city in the world. The Gold fleet started offshore racing 5 legs to give spectators a great view of both the first mark and the finish. Just returned from the Professional Windsurfing Association (PWA) competition in Noumea, New Caledonia, Auckland windsurfers Laurence Carey and Tim Wood showed their class placing first and second in the Gold fleet, with Tim closely followed by Luke Holliday and Harry Reid. Laurence Carey is the current New Zealand Slalom Champion and placed 25th in Noumea which bodes well for his 2016 season when he will be seriously racing on the PWA circuit. Windsurfing is arguably New Zealand’s most successful sailing sport internationally and Laurence hopes to add his name to the list. The Silver fleet opted for beach starts, not without it’s own challenges, and raced 4 legs. In the Silver fleet local Eastbourne sailor Peter Haan was the clear leader, with John Davies (Tauranga), Esteban Funes and William Novak (both Wellington) closely grouped in the next positions. 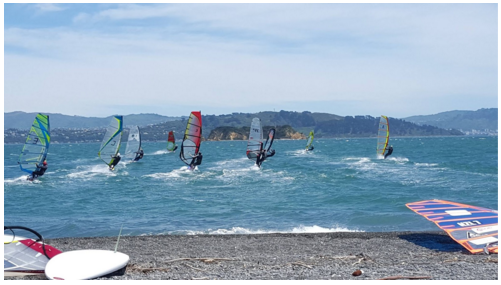 It was good to see sailors from Auckland, Tauranga and Rotorua competing alongside an increased number of local sailors, and bodes well for future events. It was great to see wave sailors turn up, most on wave boards, and I'm sure they will agree that a wave board class would be worth running if there are enough entries. Social evening at the local Bre'd tavern, with tons of cheap pizza made for a great evening. On the Sunday the competitors met around 10am but the southerly wind was not building sufficiently nor forecast to hang around, so an early call to not sail, followed by the results and prizes allowed everyone to make the most of the rest of their day. 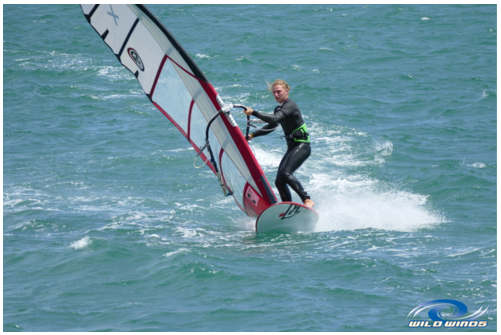 Industry support came from Team 10, T-10 fins, NZ Sailing, Epic Sports, Wild Winds and Gaastra/Tabou. Lucky sailors went away with spot prizes totalling around $2000 including a wetsuit, rigging jacket, fin bags, accessories and clothing. Local support has always been strong for this event, led this year by principal sponsors Craigs Investment Partners, with regulars Petone Pak’n’Save, Brew’d Tavern, Eastbourne Fruit Supplies, Eastbourne Lions and Eastbourne Sports and Services Club. Volunteers are essential for events like these, so a big thanks to Alex Dean who managed the starts from the boat all day supported by boat driver Sam Price. On the beach we had Jim Rogers, local Robert Ashe, and others doing the finishes with Mike Burke who also ran the BBQ and does all the awesome posters etc. for this website. 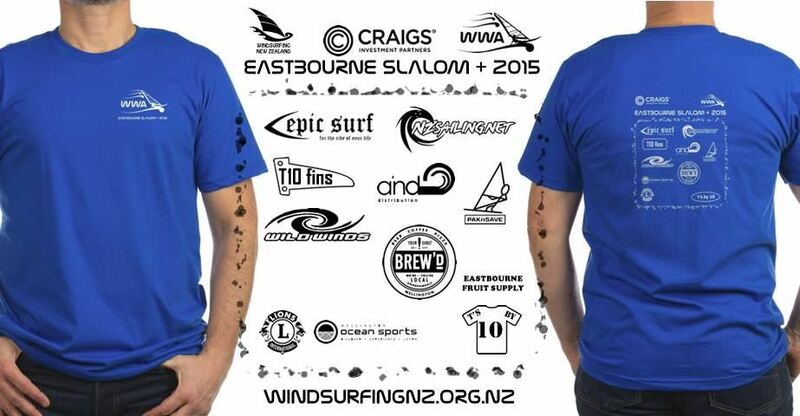 The windsurfers that helped would probably have entered so their contribution is doubly appreciated. Jim Rogers (Team 10) also provided t-shirts for all online entries, as well as a $400 plus race carbon fin as a spot prize. All this for $25! Thanks to Craigs Investment Partners whose backing made the event possible, and all the other sponsors and volunteers who made it successful yet again ... roll on 2016. The 2012 NZ Freestyle nationals were hotly contested in epic conditions. UK windsurfer Al Bentley took the competition title in a 40 knot final epic over Tom Taylor. Taylor taking top New Zealand windsurfer pushed Bentley to his best, duelling twice in competition. Wellington definitely did not disappoint, with sunny and windy conditions. Over the afternoon of freestyle action the wind climbed from 20 to 40 knots. Competitors battled their way through a single into double elimination round at the locally named spot the MCC. At the Ngatitoa Domain, the narrow channel kept the action close for spectators and judges alike. Reigning champ Tim Haxell, starting top seed, met stiff competition in fellow local windsurfer Rob Harrison. Harrison’s hard work on the latest moves saw him stomp funnels and konos to Haxell’s reportage of spock and funnel variations. Haxell’s hard and fast sailing wasn’t enough with Harrison beating Haxell, to stop his run on the title. Local icon sailor James Court brought an impressive array of spocks, forwards and crazy 40 knot willi skippers. A top wave sailor, Court showed his class, transitioning well to kept the likes of Taylor and Harrison honest. 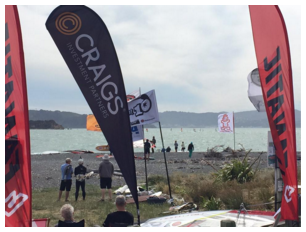 A great turn out from the young windsurfers at Worser Bay meant the youth title was there to win. William Novak and Nick Thyne brought their best to try topple favoured Jo Tildesley. The youth final was between Novak and Tildesley. A series of floaty chop hops, duck gybes and good vulcan attempts saw Tildesley take the youth title. No doubt we will see plenty more of these guys in the future. 7 minutes, 40knots and two egger sailors, Taylor end Bentley, the final was on! Taylor, previously beaten by Bentley in the end of the first single elimination, had to beat Bentley twice to take the win. Bentley came out storming with a super floaty shaka. This was not to put Taylor off, hitting a sweet shovit and flaka to respond. They dwelled in hard and fast conditions with spocks, spock 540s, flakas and switch vulcans. In the end it was Bentley’s shaka that made the difference and the title was decided. Bentley taking the competition title had been push hard by Taylor. Taylor return to the scene sees him take top NZ sailor and the all mighty trophy. A barbeque and drinks ensued to celebrate. Everyone was stoking about the competition. Great to have the young guys there and Al Bentley from the UK. Those that came down and supported, thank you. Two years of great conditions has seen the freestyle standard in NZ grow. Let’s keep it going and see you there next year! 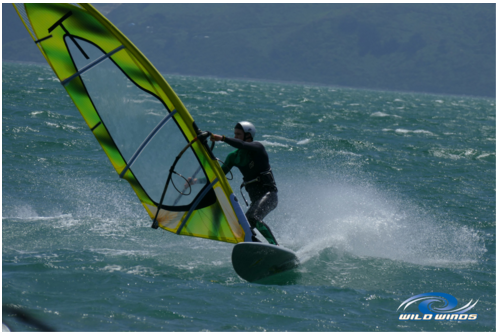 New Zealand Windsurfing Freestyle Nationals comes to Wellington this weekend (1 and 2 December). Last year Auckland turned it on with a stellar day of freestyle action. Wellingtonian Tim Haxell had to produce his best, to fend off the Aucklanders, to take the title down to the Capital. Haxell, 24, will have his work cut out again this year. The return of Wellington bread freestyle master Tom Taylor will present stiff competition. Taylor, once winner of the international JP Young Gun Freestyle Camp, will have to work hard having been off the water this year. The onslaught on the top doesn’t stop there for Haxell. UK windsurfer Al Bentley is in town. Bentley brings freestyle moves that will amaze his competitors and spectators alike. Check him out online. With the wind as promised, get yourself to the Ngatitoa Domain in Mana a.k.a. the MCC to see the action. Back up location is Evans Bay. Competition times are from 11am to 6pm Saturday and if required 11am to 4pm Sunday. See you midday Saturday for an afternoon of windsurfing freestyle action! On the day, see deepfried.tv forum for latest updates on times and locations. Due to light winds again the Harbour Blast reschduled for the 1 of April has been cancelled till next season. Three weeks have now past since Round 1 of the Wellington Freewave 2011 and we are looking down the barrel of Round 2 this Saturday 26 November 2011. Round 1 saw a group of dedicated sailors take to the water in Evans Bay for the freestyle round and for our first attempt to include freeracing. Conditions were light but just enough to run a race and a 30minute expression session. Eight competitors started the freerace from the shallows beside the rocks, racing out to a bouy on the far side of the bay and back to a finishing bouy downwind of the start. Marginal wind saw competitors slugging to the far mark with most requiring a couple of tacks to make the rounding. Leading from the front James Court tacked his way to round first while Tim Haxell pinched his way upwind to follow him in second. A straight blast to the finish saw no change in position with Nick Hunn finishing in third ahead of Rob Harrison. This was a fun new aspect to the freewave and is to continue at the next round conditions permitting. The freestyle expression session was battled out between Court, Haxell, Hunn and Harrison. Marginal planning conditions saw the competitors hunting for the gusts. Harrison decided to change down sails which saw his heat limited to non-planning moves coming in fourth place. Hunn edge ahead of Harrison with an array of old school freestyle moves. Court and Haxell slogged it out for first. Court struggled to nail his spocks, leaving his vulcans to do the talking while Haxell easily trumped him with a couple of solid flakas, gruby and vulcan to take the freestyle section of Round 1. Hopefully wind and waves will ensue for Round 2 of the freewave. Watch deepfried.tv and here at wwa.org.nz for details of start time and location. The freewave is to encourage all windsurfers to push their skills on the water and have fun in a competitive environment. 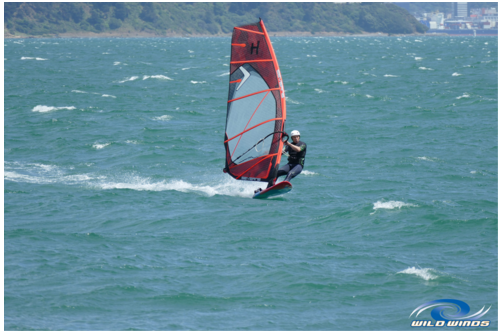 The freewave is to include wave sailing, freestyle and freeracing. The freeracing aspect is to bring something new to the freewave this year (please bear with us as we see how this goes). The goal is to have at least one wave and one freestyle focused round in the series conditions permitting. We will attempt to run a freerace at the start of each round. The freeraces will likely start from the beach or by bouy rounding aligned with a flag on the shore. Racing will be to an outer mark and back to either a beach finish or bouy rounding also aligned with a flag on the shore. Only wave or freestyle gear is allowed. Placing in the freeraces over all the three rounds will be combined to give an overall freerace ranking over the series. This will be considered in the final placing alongside the placings from the wave and freestyle sections. Please see the Freewave events page to find out about how the events will be judged. The second round of the Freewave Series has been moved to 26th November 2011 so that it doesn't conflict with other on the water stuff happening that weekend.